This temple was built by the two pharaohs: Amenhotep lll and Ramses ll. The temple was dedicated to Amun-Ra, whose marriage to Mut was celebrated annually, when the sacred procession moved by boat from Karnak to Luxor Temple. 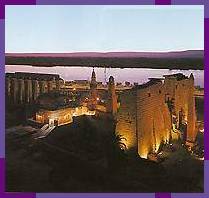 Luxor remained the seat of power from 2100 to 750B.C. The entrance is a huge pylon built by Ramses ll and has two seated statues of the king. Originally, two large obelisks stood in front of the pylon. However, only one remains, while the other now stands in Place de la Concorde, in Paris. Beyond the pylon, is the peristyle hall - built by Ramses ll - and bordered on three sides by double rows of columns with bud papyrus capitals. In the north-eastern part of the hall is the Mosque of Abul Haggag. 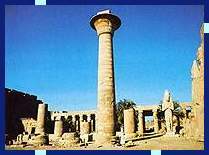 The rest of the Temple was built by Amenhotep lll, starting with the Colonade that has fourteen huge pillars in two rows. Then we come to the large Court of Amenhotep ll that is surrounded on three sides by double rows of pillars. This leads to the hypostyle hall, containing 32 pillars, and onto the Sancturay of the Sacred Boat. Finally, we reach the four-columned Holiest of Holies: the Sanctuary of the Sacred Statue. The Sacred Lake, used for purification, lies outside the main hall where there is a large statue of a scarab, dating to King Amenhotep. This spellbinding show, through the exquisite use of words, light and music, tells the story of this magnificent temple. Karnak is a religious compound of temples dedicated to Amun (symbol of fertility and growth), his wife Mut and their son Khonsu ( the moon deity). Since the Arab conquest, it became known as 'al-Karnak' : the Fort. The temple starts with the Avenue of the Rams, representing Amun: symbol of fertility and growth. Beneath the rams' heads, small statues of Ramses ll were carved. A visit to Karnak would start by passing through the First Pylon, dating to King Nekhtebo of the 30th Dyanasty, on to the large forecourt where on the right are the chapels of the Thebes Triad, dating to Seti ll. On the left, there's the Temple of Ramses lll. Then one finds the remnants of the Second Pylon which lead to the large hypostyle hall which has 134 columns, with the double row in the middle higher than the rest. Following these are the remnants of the Third Pylon,before which stands the obelisk of Tuthmosis l, and on to the fourth Plyon, guarded by the obelisk of Hatshepsut. Beyond, are the remains of the Fifth Pylon, leading to the Holiest of Holies. And finally there is the court, from the Middle Kingdom, which leads to a large Hall of Ceremonies, dating back to Tuthmosis lll.